Finally another fermented veggie recipe! 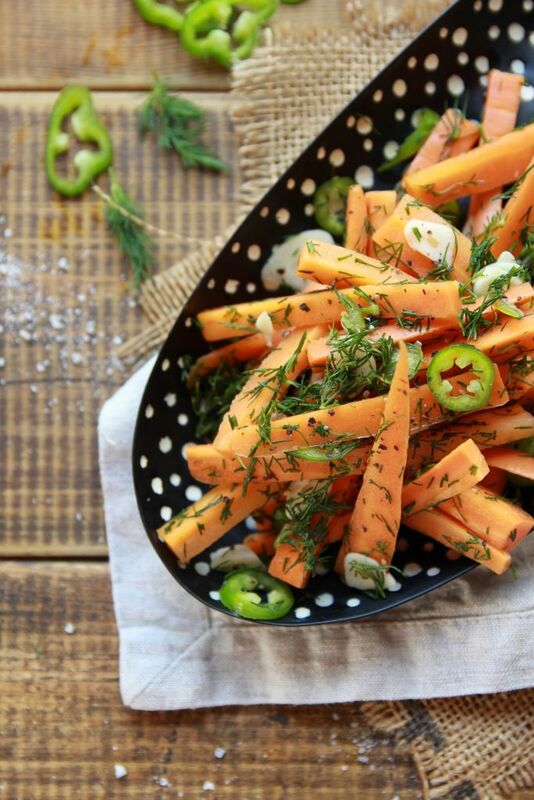 Hope you’re as excited as I am, because not only are these fermented carrots spicy, and infused with fresh dill and garlic, they go great in a veggie bowl, sandwich, salad, or on their own! All you need is a glass jar, a few basic ingredients, and you’re ready to begin. A few things you need to remember when fermenting is to use a good quality sea salt that hasn’t been stripped from its natural minerals and profiles, and to use the right amount of sea salt. Too little and you’re welcoming unwanted bacteria and mold, too much and you can disrupt the fermentation process all together. After knowing this, you can play around with flavors. Today I went minimal with some freshly chopped dill, crushed garlic, and finely sliced jalapenos, and the end result was out of this world. But do feel free to mix it up however you wish. But the best part in my opinion is how quick they are to ferment. These fermented carrots take less than 5 minutes to make, and taste amazing after just 3 days of fermenting away at room temperature. I found that 3 days was enough for mine, but keep an eye out to see when it starts to bubble, and tastes unto your liking, then transfer the jar to the fridge, and enjoy for months! That’s if you can resist the urge to eat them all at once. Wash your hands, and have a glass jar, cutting board, and knife ready. Start by washing the carrots and cutting off the ends. Slice them into thin strips, and place into a clean glass jar. I sliced mine into roughly 1 inch long (3 cm) thin strips. Wash the dill, peel and finely slice the garlic cloves and place into the jar. Mix the sea salt with a little bit of water, then pour into the jar and add enough water to cover the carrots. Finally, weight the carrots down, so that the carrots will stay under the brine. To weight down your carrots, place a plastic sandwich bag on top of the carrots, and weight it down with a pebble, shot glass, or anything you have on hand, as long as your veggies stay under the brine. This is important because if your carrots get in contact with the air, mold will happily greet them! Close the jar, with an airlock attached, place it on a small plate and keep at room temperature, away from direct sunlight for 3 to 5 days. Taste after 3 days. Once you’re satisfied with the taste, transfer into the fridge. When you want to eat them, take desired amount out of the brine, along with some sliced garlic, place in a serving bowl. Add some finely sliced jalapenos, finely chopped fresh dill, and black pepper to taste, mix and serve. 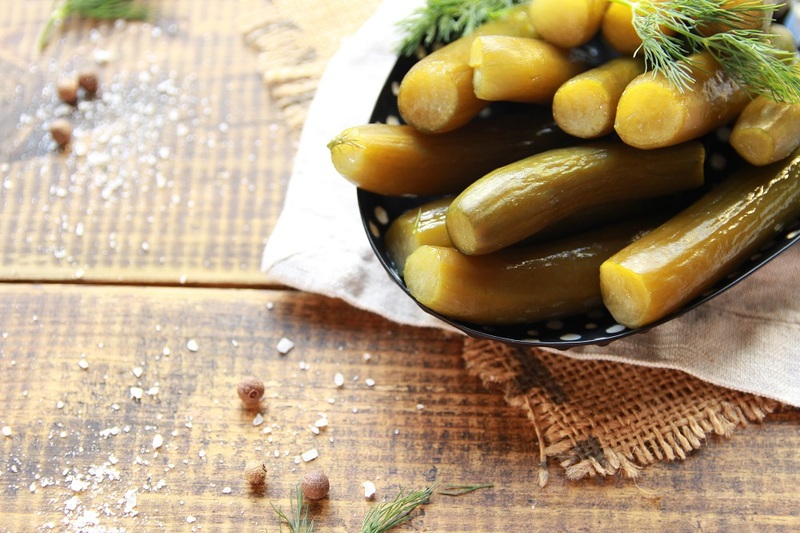 Next Time Try My Homemade Dill Pickles! These look lovely!! Simple and yet infused with some delicious flavors from the fermenting! Love the pictures :). 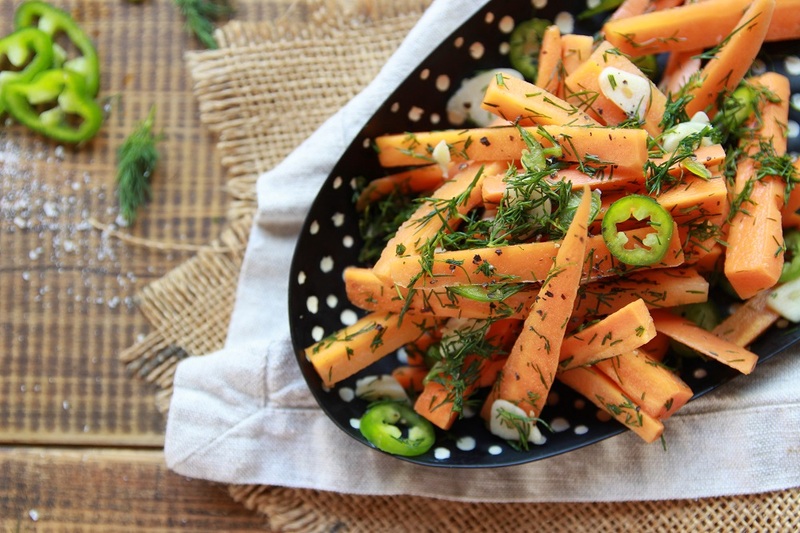 These look delicious, my family loves fermented carrots but I’ve never went overzealous with the dill or added jalapenos too. This sounds so delicious. I can’t wait to try it at home and surprise the fam! Thanks for your lovely comment Billy! 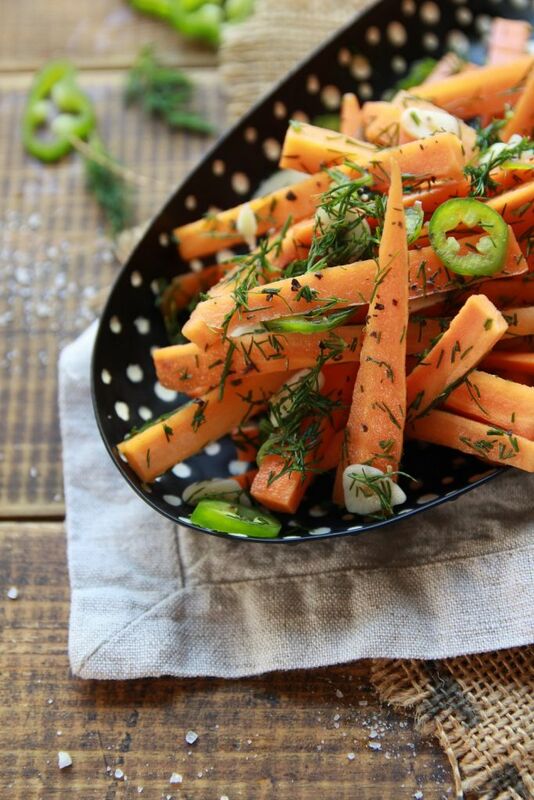 They add so much flavor to these fermented carrots, almost like eating a starter salad. 🙂 Enjoy!